Secretary-General António Guterres (left) and Geraldine Byrne Nason, Permanent Representative of Ireland to the UN and Chair of the sixty-second session of the Commission on the Status of Women (CSW), at the opening of the session. Taking place at “a pivotal moment for the rights of women and girls,” the United Nations body dedicated to gender equality and women’s empowerment opened its annual session on Monday hearing calls to help women, especially those in rural communities, secure an end to the male-dominated power dynamic that has long marginalized their participation and muted their voices. “Across the world, women are telling their stories and provoking important and necessary conversations – in villages and cities; in boardrooms and bedrooms; in the streets and in the corridors of power,” said Secretary-General António Guterres, opening the 62nd session of the UN Commission on the Status of Women (CSW62). “From ‘MeToo’ to ‘Time’s Up’ and ‘The Time is Now’ […] women and girls are calling out abusive behaviour and discriminatory attitudes,” he added. Under the Commission’s theme ‘Challenges and opportunities in achieving gender equality and the empowerment of rural women and girls,’ the UN chief observed that although a marginalized group, they were often the backbone of their families and communities, managing land and resources. Mr. Guterres said that supporting these women is essential to fulfilling our global pledge to eradicate poverty and to create a safer, more sustainable world on a healthy planet – 2030 Agenda for Sustainable Development. Mr. Guterres painted a picture of a male-dominated world with a male-dominated culture in which centuries of patriarchy and discrimination have left a damaging legacy. Secretary-General António Guterres addresses the opening meeting of the sixty-second session of the Commission on the Status of Women (CSW). The President of the UN Economic and Social Council (ECOSOC), Marie Chatardova pointed to the Commission, as a critical instrument to strengthen the global normative framework for women’s empowerment and the promotion of gender equality. The body is also as a key driver of ECOSOC’s work, with the Commission’s outcomes as bolstering the 2030 Agenda’s implementation and that of its 17 Sustainable Development Goals (SDGs), which seek to end poverty and ensure prosperity for all on a healthy planet. Noting that gender equality and the empowerment of women and girls is a theme that cuts across all the Goals, Ms. Chatardova said the Commission’s focus on rural women and girls was both timely and well-aligned with the 2030 Agenda. According to the ECOSOC President, inclusion is a key element in all efforts. Noting that the Commission has long provided a roadmap for the UN’s work in women’s empowerment and gender equality, she announced a special Council session in May to build sustainable, inclusive and resilient societies. Marie Chatardová, President of the Economic and Social Council for 2018, addresses the sixty-second session of the Commission on the Status of Women. Mr. Lajčák underscored that this needs to stop, and that women must be taken into account in all actions, from access to water to closing pay gaps. Drawing attention to rural women as a major source of innovation, he explained that their empowerment would benefit everyone. “Thank you for continuing your calls. Let’s make them stronger than ever,” he concluded. Miroslav Lajčák, President of the seventy-second session of the General Assembly, addresses the opening meeting of the sixty-second session of the Commission on the Status of Women. UN Women Executive Director Phumzile Mlambo-Ngcuka highlighted the importance of this year’s focus on rurual women. 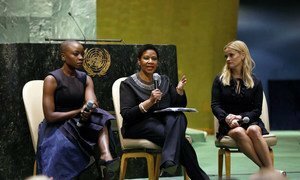 “It speaks to our commitment to fight some of the biggest challenges of our time: poverty, inequality, intersectionality and an end to violence and discrimination against women and girls, no matter where they live, or how they live, so that we ‘leave no one behind,’” she stated. “Women are fighting to take steps that change their lives, and they are refusing to accept the practices that have normalized gender inequality, sexual misconduct, exclusion and discrimination across all walks of life,” she argued. Phumzile Mlambo-Ngcuka, Executive Director of the UN Entity for Gender Equality and the Empowerment of Women (UN Women), addresses the opening meeting of the sixty-second session of the Commission on the Status of Women. The chair, Geraldine Byrne Nason, said the current session is a key moment on the path to ending discrimination against women and girls once and for all. Indeed, “time is up” on women taking second place around the world, she said, challenging the Commission to do more and do better. CSW functions under ECOSOC, acting as the UN organ promoting gender equality and the empowerment of women. CSW62 runs until 23 March.